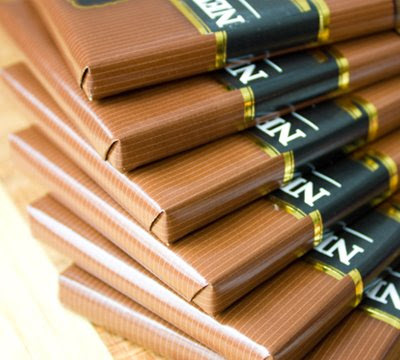 Newman's Signature Series Chocolate. Gourmet Quality? 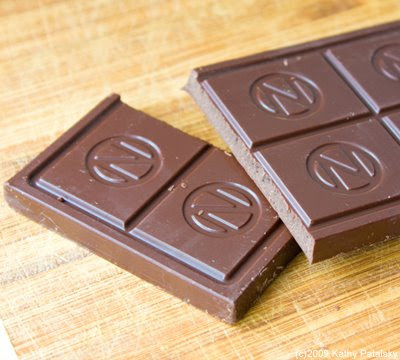 Green, Eco-Friendly Gourmet Chocolate. 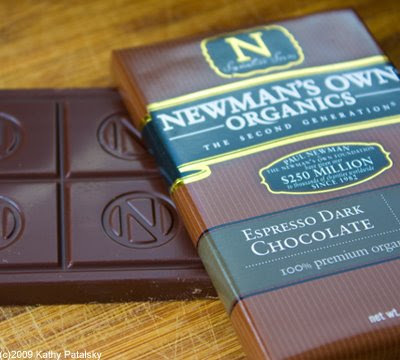 First off, Newman's new line of signature series chocolate is good for the planet. Organic and Rainforrest Alliance Certified. It bears the USDA organic seal. 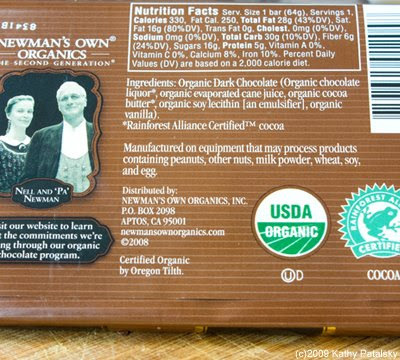 The USDA Organic Seal assures that at least 95% of the ingredients are organically certified. And that's not all, Newman's Own brand has given a lot of money to worth-while causes over the years. Newman's Own Organics. Good People. 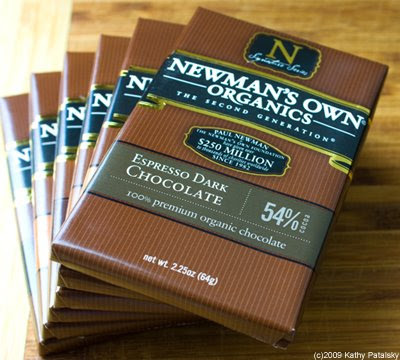 "Newman’s Own Organics was established as a division of Newman’s Own in 1993, and became a separate company in late 2001. Paul Newman has given over $200 million to thousands of charities worldwide since 1982." Shelf Appeal: Nice. Sleep new packaging with an inner gold wrapper. 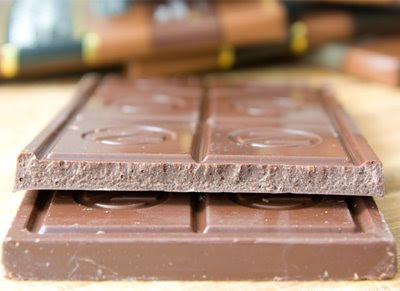 I love the fact that the chocolate bars will be available in two sizes: 3.25-ounce and 2.25-ounce. Flavors include: Dark Chocolate, Super Dark Chocolate 70% Cocoa, Mocha Milk Chocolate, Milk Chocolate, Espresso Dark Chocolate, Orange Dark Chocolate. The only vegan ingredients flavors are the dark chocolate varieties. And I love the large squares with big N's on each square. Label Check: Organic certified. Rainforrest Alliance certified cocoa bean farms are used. 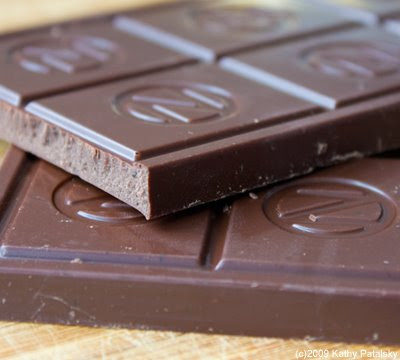 For the most health benefits, go with the 70% Super Dark Chocolate flavor. Super Dark ingredients: Organic Dark Chocolate (organic chocolate liquor*, organic evaporated cane juice, organic cocoa butter*, soy lecithin [an emulsifier], organic vanilla). Bars are around 300 calories. 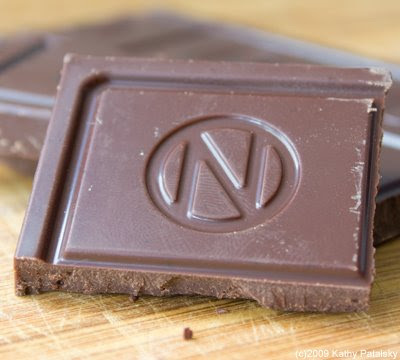 When it comes to chocolate, this is some of the good stuff. Taste Test: To quote my husband: "oh my God! This is so good!" He tried both the peanut butter cups and dark chocolate bars and loved them. And I have to agree. These are not ordinary chocolate bars. And they are better than the traditional Newman's chocolates. This new Signature Series is creamy, dense and has a pure intense chocolate flavor. Not too sweet and not too bitter. And the espresso flavor was bold like a bar of a mocha coffee drink. As store-bought chocolate goes, this is some of the best I've tasted. Price Check: Around $2.50-$3 in price. Depending where and how many you buy. 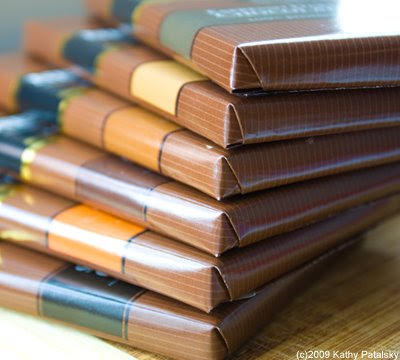 Competitive pricing with other organic chocolate bars. 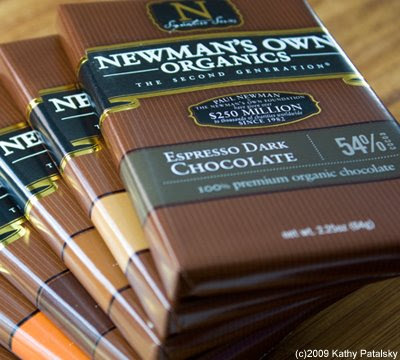 Last Word: Tried Newman's Chocolate before? Try it again-the new signature series. It's different. Watch out chocolate snobs, this in-store brand is boutique store quality. Learn more about the chocolate at: Newman's Own Signature Series Chocolate website.